TomTom is a respected GPS tycoon, which makes receivers and also provides the map data and know-how. Now it looks like it’s thinking of branching out into the street viewing business, which is Google and Microsoft exclusive territory so far. We guess those two wouldn’t exactly appreciate that. This comes after a very intriguing picture was uploaded to Tumblr.com, showing a TomTom van with a 360-degree cam mounted on top of it. What else could be used for except making an all-round street view service? According to Engadget the vans seem to be sighted in France and Belgium only, so far. 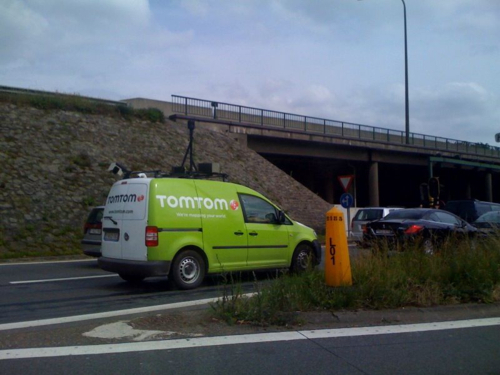 So this would indicate that the TomTom street view service will be launched there at first, meaning Europe. Google introduced this service to the world via its Street View option at maps.google.com and in Google Earth and it spread from there into Android and iOS devices. Bing Maps came as a competitor to that with its StreetSide option. It’s only fair and logical that another competitor would want a piece of the spoils. Especially when dedicated SatNav units are slowly but surely losing marketshare to smartphones.